Dental implants are a simple answer to tooth loss. 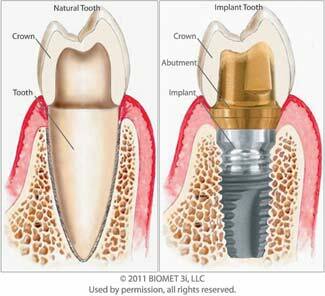 Implants are artificial roots that are implanted to replace missing teeth. Implants are used to replace single teeth or multiple lost or missing teeth. Implants are a welcome alternative to fixed bridges and removable dentures for replacing missing teeth. Implants look natural and will be fully functional. The dental implant is comprised of three parts. The first part is the Titanium implant that is inserted and anchors to the bone. The second part is the abutment that is attached to the implant (or anchor) and protrudes through the gum tissue. The third part is the crown which is custom fitted to each patient to give a natural appearance. With proper hygiene, implants can last a lifetime. Dr. Freeman will work with you and a dental specialist to place the dental implant. Thereafter, Dr. Freeman will fabricate and place the cosmetic dental implant crown at his Skokie dental office. Call our office at 847-675-7040 for your complimentary dental implant consultation with Dr. Freeman.